The Provisioning App utility can be used to import Requesters into ServiceDesk Plus On-Demand from your AD/LDAP. It can also be configured to run as a Scheduled Task in Windows to automatically add, update, disable or delete users from SDP On-Demand on a periodic basis. 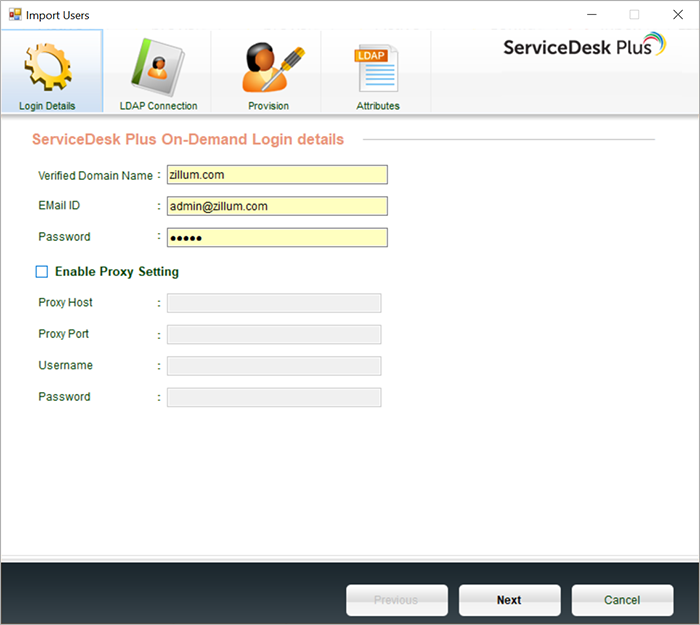 User Management in ServiceDesk Plus On-Demand is powered by Zoho. So, a Zoho account would be automatically created for each of the imported user. 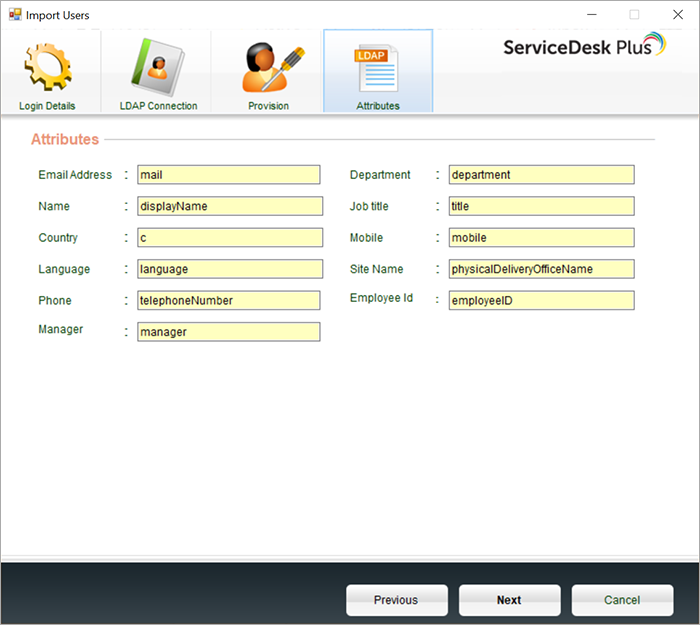 ServiceDesk Plus On-Demand account with organization admin credentials. A verified domain in SDP On-Demand. You can add and verify your domain in Admin ---> Organization Details ---> Domain Details page in ServiceDesk Plus On-Demand console. The Provisioning App utility is built over .NET Framework 4.5. So the app runs only on Windows systems and the .NET Framework must be available in the Windows system. Recent Windows operating systems have .NET Framework available by default. In case if this is not available, you can download it from here. The following fields can be imported with the Provisioning App: Name, EMail, Phone, Mobile, Site, Department, Manager and Job Title. 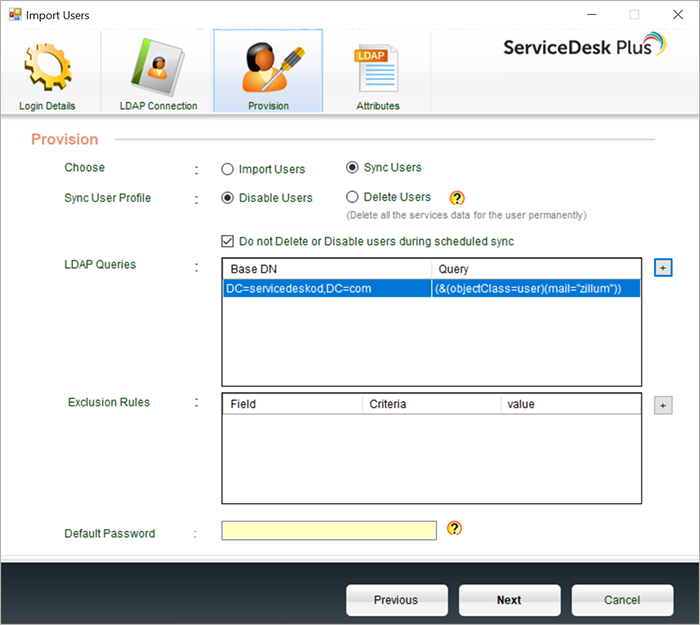 If you have configured any additional fields for the Requester, they can also be imported, if corresponding values are available in AD/LDAP. 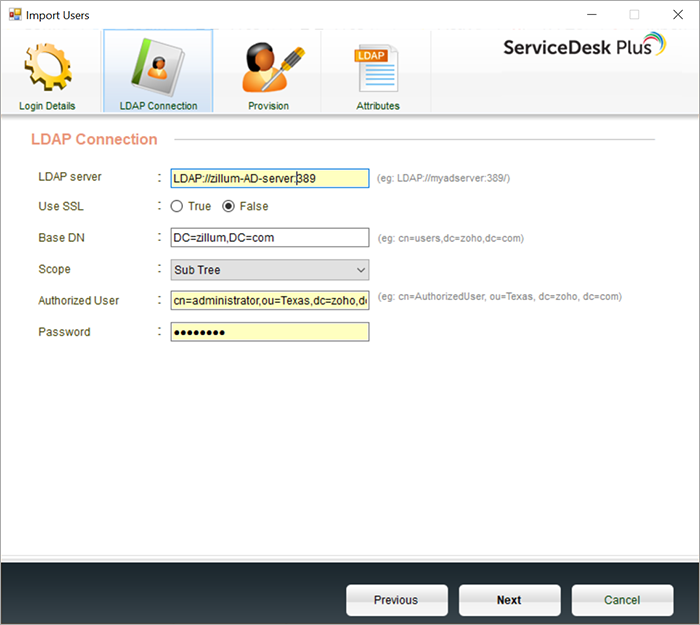 Department and Site will be automatically created, if the details are available in LDAP, and if the corresponding Department / Site is not present in SDP On-Demand. User Management in SDP On-Demand is powered by Zoho. So, a zoho account will be automatically created for each of the imported Requester. You can give a default password in the "Provision" tab. New Zoho Accounts to be created will have this as the password. Please remember to note this down and inform your organization users. This password is needed to login if you are not using SAML Authentication. The default password will be set only for new Accounts that are going to be created. For accounts created already, password will not be changed during sync.Please ask your users to change this default password. If you are planning to use AD credentials to login please refer here. You can manually run the Provisioning App tool and select the sync option. It will show you the list of users to be added or deleted/disabled. You can select the users and sync them. You can configure the above command in the Windows Task Scheduler for periodic sync'ing. An email wouldl be sent to the given address whenever new users are added or users are deleted/disabled. 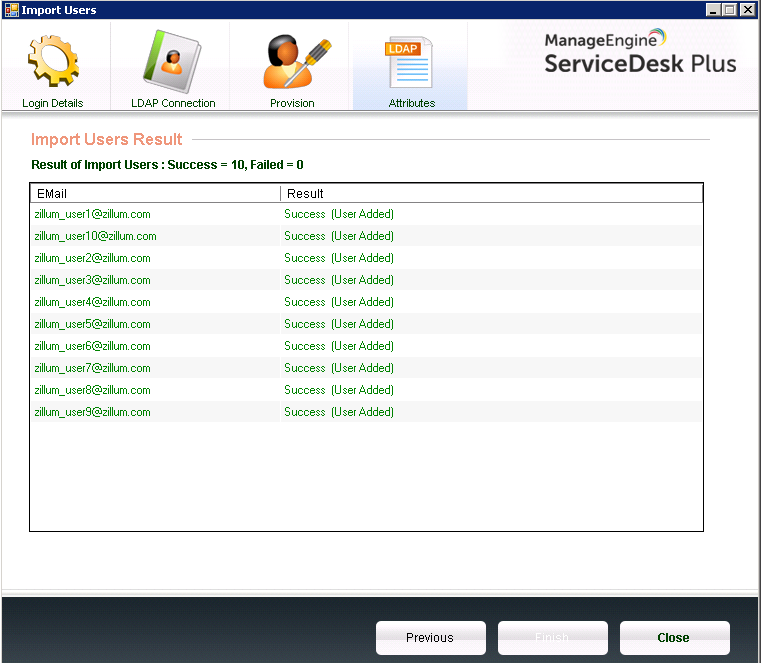 Emails would not be sent for any update to user details like Department or Site, etc., You can see the system log anytime in Admin page of ServiceDesk Plus On-Demand console for details about requester add, update or delete. For more details about configuring scheduled sync, please refer here. You can use a Global Catalogue to query multiple domains in a single forest. Instead of "LDAP://", you can give "GC://" in the Provisioning tool. 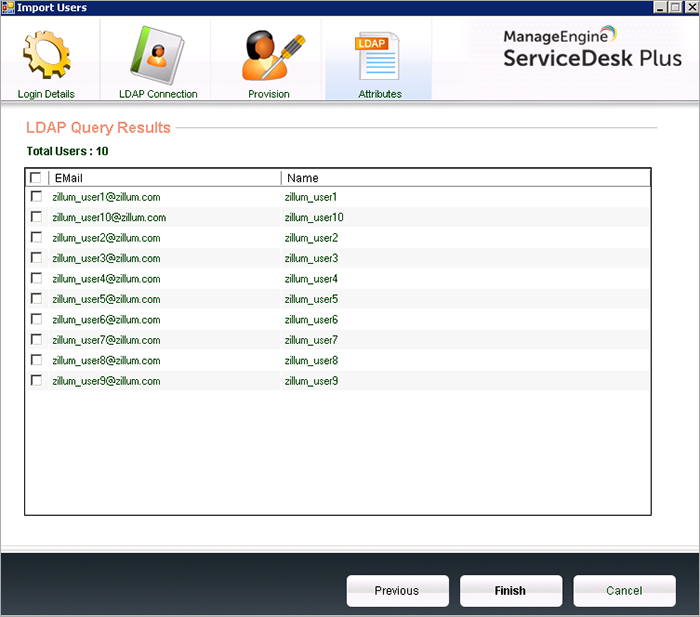 This way you can search the Global Catalog and do an import or sync of all the users in same forest with SDP On-Demand. You need to run the Provisioning tool multiple times to import users from multiple forests. There is no option to sync users from multiple forests.